Peonies typically grow outdoors in gardens, but you can also grow them in big containers since they have larger roots than other plants. 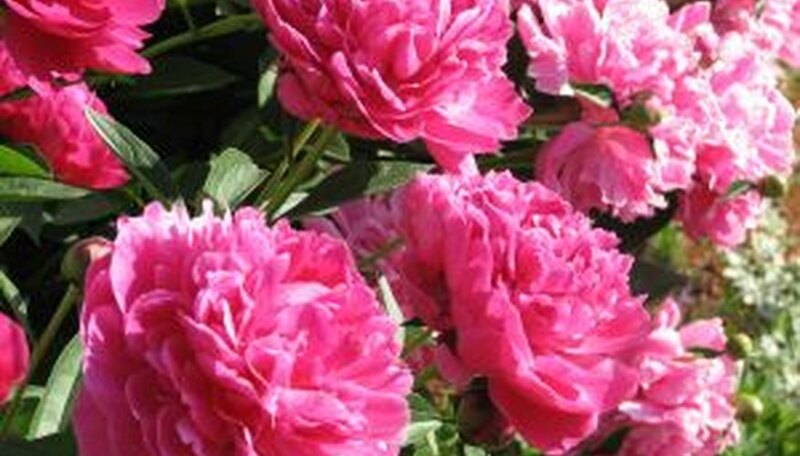 There are several varieties of peonies. Tree peonies are best for containers since they are smaller than the herbaceous and inter-sectional varieties. For best results, plant your peony in the fall. Fill the container with about 2 inches of gravel and well draining soil. All-purpose potting soil high in nutrients will suffice. Use a large container at least a 12 inches wide and 1 ½ feet deep. The container should have holes for drainage. It should also be light colored so it does not absorb too much heat, which can harm the plant. Plant one peony in the center of the container with the top of the root 2 inches under the top of the soil. The bottom of the root is generally about 12 inches deep. Cover the root with soil and pat it down to eliminate air pockets. Water the peony and keep it evenly moist. Mulch to accomplish this. Do not over water. It is better to let the peony dry out at times than to over water. Cut back the peony after the growing season, usually in the fall. Tree peonies will shed their leaves, but if you have herbaceous and inter-sectional peonies, cut them back within and inch or two of the soil. Keep your peony in a cold environment for the winter. They need cold weather to go dormant. Because it is in a container and not in the ground, deep freezing is a concern. Keep the peony from going into a deep freeze by placing it in an area close to freezing temperature, such as a garage or crawl space.